Examples of this abound. Pachamama Alliance's indigenous partners in the South-central Amazon rainforest in Ecuador are standing up to resist oil exploration in their pristine rainforest territory, and First Nations in Canada have been defending Canada’s Boreal forest against tar sands development. The latest and highest-profile example of this is the resistance to the Dakota Access Pipeline, a rapidly growing movement led by the Standing Rock Sioux Tribe. Unless halted, the Dakota Access Pipeline will span 1,172-miles, originating in western North Dakota near Stanley, and will end near Patoka, Illinois, carrying more than a half-million barrels of crude oil daily from North Dakota's Bakken oil fields where it is extracted through underground hydraulic fracturing, also known as fracking. From Illinois, the oil will be piped to terminals and refineries along the Gulf of Mexico, where it could be exported. The pipeline is planned to run within a half-mile of Standing Rock Sioux Reservation, home to about 9,000 people. The $3.8 billion Dakota Access Pipeline, also called the Bakken Pipeline, was facilitated by multiple governmental institutions at the national and state level but is fueled by corporate powerhouses such as Energy Transfer Partners LP, Phillips 66, Enbridge Energy Partners LP, and Marathon Petroleum Corp. Meanwhile, a recent study revealed two dozen major banks and financial institutions, many of them overseas, are financing the pipeline through these companies. On July 26, 2016 the Dakota Access Pipeline’s permits were approved by the U.S. Army Corps of Engineers (USACE). Without USACE’s approval, the pipeline could not be built. While the USACE is required by the National Historic Preservation Act to consult with Native American tribes on projects that stand to affect culturally significant sites, tribal leaders and environmental activists say that the USACE’s draft environmental assessment failed to disclose that the route would bring the pipeline near tribal citizens. Meanwhile, Energy Transfer Partners, doing business as Dakota Access LLC, failed to disclose Standing Rock’s presence on all maps and analysis, in violation of environmental justice policies. Aside from the USACE’s failure to consult with them beforehand, Standing Rock inhabitants are aware that the pipeline—with such proximity to their local drinking water—could eventually contaminate it, due to the preventable but pervasive occurrence of pipeline failure, which releases toxic oil and other hazardous chemicals through stress corrosion cracking, frost, earthquakes and, most importantly, human error. In addition to the fear that the pipeline would contaminate their drinking water, the tribe has a concern that the pipeline would also harm sacred burial sites. On September 2, the Standing Rock Sioux Tribe provided the United States District Court for the District of Columbia with a declaration that described a number of important and unusual archaeological finds uncovered by Earthjustice, the tribe’s legal advocate, over a two mile stretch of land near Cannon Ball, in the pipeline’s path. It described numerous gravesites and culturally important stone features. The very next morning, Energy Transfer Partners sent bulldozers to the same archaeological sites, leading to an intense standoff and possibly to the destruction of sacred artifacts. Beginning on April 1st, protectors in solidarity with the Standing Rock Sioux started congregating at the Sacred Stone Spirit Camp, established at the confluence of the Cannonball and Missouri rivers in North Dakota. Since then, more than 200 tribal nations have assembled peacefully there to resist the pipeline, travelling from as far as Hawaii, Canada and Latin America. As Jon Eagle Sr., the Tribal Historic Preservation Officer at the Standing Rock Reservation affirmed, this is the first time that leaders from across the Sioux Nation—representing all Sioux groups—have come together since 1876. 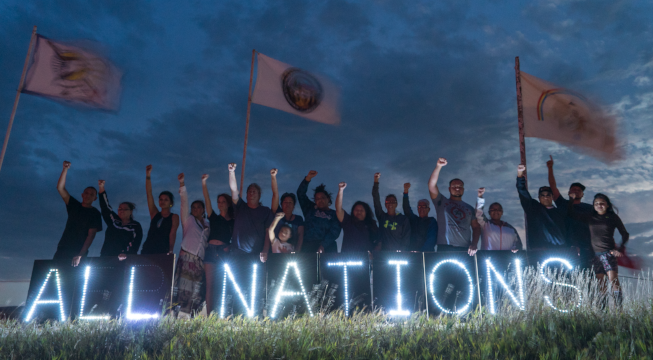 The Standing Rock Sioux have garnered support from a multicultural array of grassroots networks across the country. More than 4,000 activists, including delegates from Black Lives Matter, have traveled to the Sacred Stone Spirit Camp to participate in direct action demonstrations blocking the pipeline. The Green Party’s presidential candidate Jill Stein attended the site to show solidarity and spray-painted a bulldozer with graffiti reading “I approve this message” leading to a warrant for her arrest. Local officials in North Dakota’s Morton County also issued an arrest warrant for Democracy Now! host and executive producer Amy Goodman due to her documentation of the use of pepper-spray and attack dogs upon demonstrators. Altogether, about 70 protectors have been arrested so far in Morton County, including the Standing Rock Sioux Tribe’s chairman, Dave Archambault II. A number of influential celebrities have voiced their support for the Standing Rock Sioux’s right to reject the pipeline, including Leonardo DiCaprio, Susan Sarandon, Shailene Woodley and Bernie Sanders. Demonstrations in solidarity have been held in over 100 cities around the world. Given the change in geopolitical landscape since those warriors earned their fame, the Sioux and other tribes have no intention of taking up arms, despite initial allegations. Instead, the the Standing Rock Sioux filed an injunction against the U.S. Army Corps of Engineers, claiming that it violated the National Historic Preservation Act. Complimenting this, the original purpose of Sacred Stone Spirit Camp was to prevent construction until the hearing on September 9th, when the tribe hoped that U.S. District Judge James Boasberg would approve their application. Hearts sunk when this request was denied. However, less than an hour later, the United States Department of Justice (DOJ), the Department of the Army and the Department of the Interior released an unexpected joint statement saying that for the time being, pipeline construction will not be permitted near North Dakota's Lake Oahe, a Missouri River reservoir bordering Standing Rock. Dakota Access LLC has been asked by the federal government, in its recent statement, to voluntarily halt construction until the Army determines whether it will need to reconsider any of its previous decisions regarding the Lake Oahe site under the National Environmental Policy Act (NEPA) or other federal laws. Following the ostensible victory, there was a fear that activists would disengage despite the government's relatively weak intervention. This concern dissolved a few days later when nearby protectors discovered that Dakota Access Pipeline LLC had sent contractors back to work near Standing Rock, leading to the arrest of over 20 demonstrators in Thunder Valley during an international day of action on September 13. While the immediate imperative upon protectors is to keep the pipeline at a safe distance from the Standing Rock Sioux Reservation through direct action, much more dialogue is needed if a long-term solution is to be established. Pachamama Alliance's free course, Awakening the Dreamer, was created in response to an invitation from indigenous people of the Ecuadorian Amazon to share their perspective with the modern world and will equip you with the education, resources, and community needed to take effective action in creating a new future that works for all.